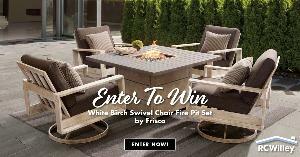 Prize: White Birch Swivel Chair Fire Pit Chat Set - Frisco. What you must do to enter: fill out the entry form. Statistics: This contest was opened by 8 and entered by 1 ContestChest.com members. 12% of those who opened the contest, entered it.